Ruthann Amarteifio: It has been a long time. So Dady, you have been writing a book called We Have Dared to Be Free, for five years. Before the dreadful earthquake in Haiti in 2010, you were not doing what you’re doing now, your life has done a turn about, am I right? Dady Chery: My life completely changed. The earthquake made me a journalist. I was a professional scientist, and I began to really examine what was going on in the news. I didn’t know what was happening with my family there. I was worried, because they were living in a two-story house that was on a ravine. As a scientist, if I thought about things rationally, they didn’t make it. I had to find things to do, and the news about Haiti in the US were presented completely differently than in the Haitian news. You had Haitian kids who were tearing up walls to get their classmates out of schools. You had all sorts of heroic actions from Haitians, which were never mentioned in the US press. 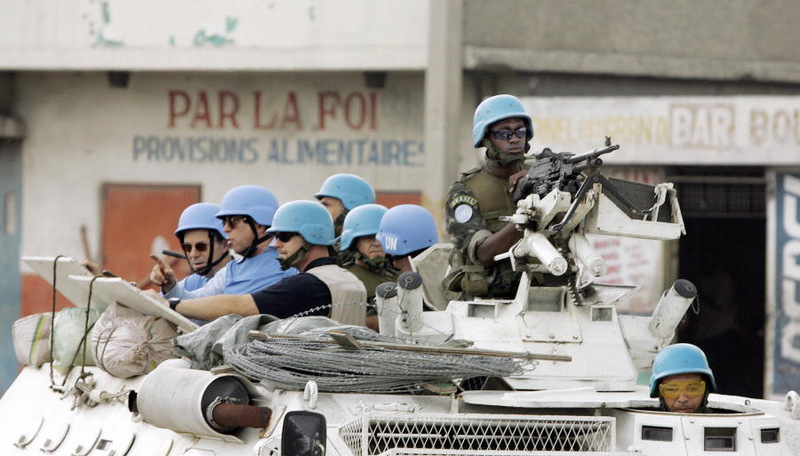 You had the fact that the UN peacekeepers were not paying any attention to Haitian victims. They were mainly helping each other. 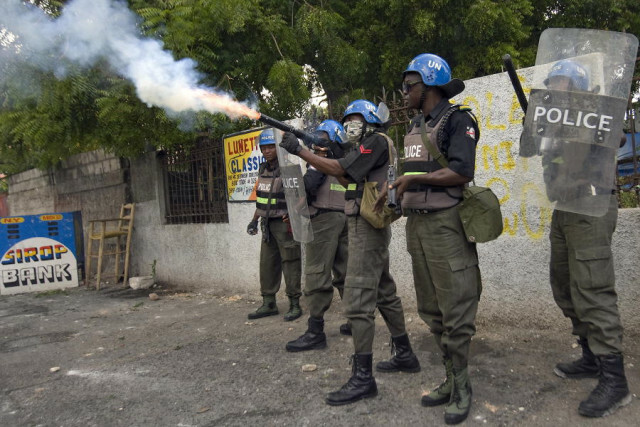 It was the same for the Haitian police: they were guarding the homes and businesses of the rich. It was Haitians who dug each other out of the rubble during those first crucial 36 hours. What we were seeing in the US news was that Haitians were helpless. We were getting these images of Haitians who could not do anything for themselves, who were sitting around, desolate and in shock. People were supposed to go to Haiti and take over and help. Part of this was manipulation, and it went on for months after that. 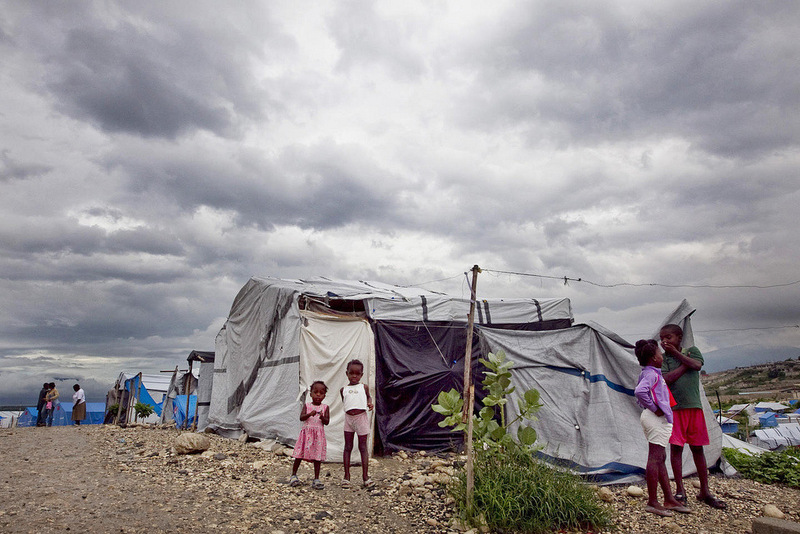 You had all these people living in tents, and the Haitian government was keeping them there! The whole idea was for one head of state after another to come and visit, and to see the poor miserable Haitians, open their pocketbooks and give aid money. RA: Right before the earthquake, I did not know much about Haiti. But after the earthquake, I was horrified, and meanwhile I saw all the charity organizations rise up…. If these were legitimate, Dady, why haven’t things changed? DC: Thirteen billion dollars were poured into Haiti. I like to think of it that way: you have a country of 10 million people, you donate $13 billion of charity…. This is money that Haitians had earned by their comportment in the US and other places, because Haitians have behaved very admirably wherever they’ve been…. You have $13 billion of aid money divided by 10 million people. Ultimately, every Haitian man, woman and child wound up giving the world $1,300. That’s the way I think of it. 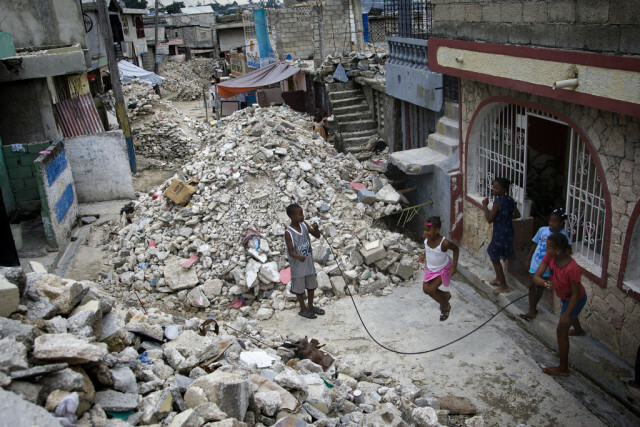 After the earthquake, Haitians wound up becoming the biggest aid donors to the world. That money was supposedly given to Haitians, but it was taken and spread around among the various friends of the donors. It was a big money laundering operation! It was given to companies to do reconstruction who never constructed much of anything. You have, for example, a Brazilian company called Constructora OAS Ltd: they built half a road and then they left. And then you had luxury hotels being built out of this aid money. People were living in tents month after month, after month. There’s still about 85,000 people without homes. It’s just incredible what happened! It’s like you give to somebody who is needy, and a bunch of people come and they steal it, and then they spread it around. RA: It is totally immoral, and it has to be illegal! DC: It should be illegal. Clinton was at the very top of the food chain. Within three months of the earthquake, he had the country vote on an emergency law that basically put him in charge of the reconstruction. He formed this organization called the Interim Haiti Recovery Commission (IHRC), and they got 18 months of complete freedom to reconstruct Haiti. He was in charge for 18 months. At the end of the 18 months, people were looking through the rubble for the money, and they couldn’t find it. RA: What a joke! I believe that recently more people were going to be removed from an island? 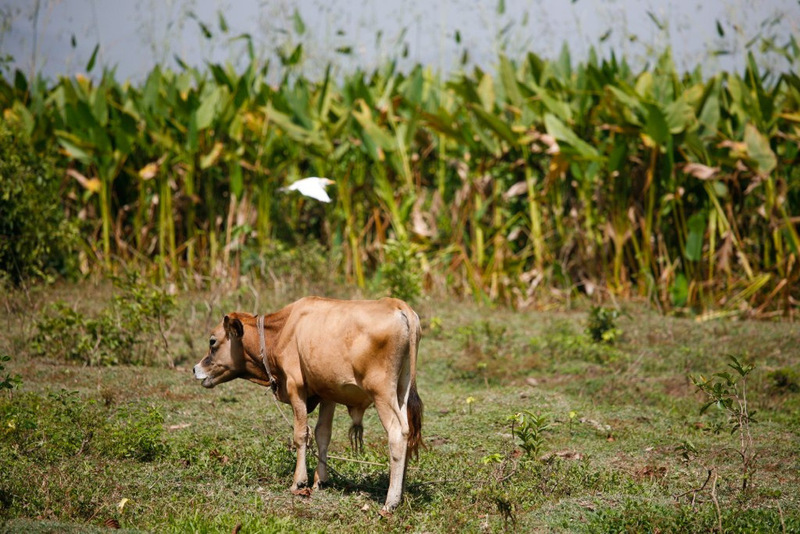 DC: That was Ile-a-Vache, and I wrote extensively about it. It is a little offshore island, where you have about about 20,000 people who are farmer-fishermen. They live all over the island: a 20-square-mile island that is very well populated. They need to be on the coast because that’s where they fish. Under Martelly, the Haitian central government declared all the offshore islands to be under their direct control. They conceived this plan that they called ecotourism; except the plan included a golf course, an airport, dredging a virgin coast so that they could bring huge ships, and the people themselves would just be squeezed into the center of the island. That was the plan, and they did not even tell people this. They just showed up to survey everything, brought in heavy construction machinery. People took to the streets in protest…. they formed their own organization, and they are still protesting. The Ile-a-Vache land grab was a project especially of Laurent Lamothe, the former prime minister, and the tourism minister, Stephanie Balmir Villedouin. She brought the island under the wings of the tourism ministry, meaning: forget the mayor, forget the local governance of the island, she is going to decide building codes, she is going to decide everything about the island. It all goes back to Bill Clinton, ultimately. Lamothe was on the Interim Haiti Recovery Commission with Clinton; he became PM because he was Clinton’s buddy. She was appointed by Lamothe. In the Haitian government, the prime minister is the one who appoints all the various other ministers. Even though Lamothe is gone, she’s still there. RA: The first round of the elections in Haiti was a couple of days ago, right? DC: Oh my goodness! The elections are a farce! People are so angry about these elections. It is such a huge insult to Haitians. You had sizable cities, like Jeremie, for example, where they had to shut down all voting. About 50 percent of the polling stations were closed because of intimidation, vandalism, you name it. It was a debacle! They didn’t have people in line, they didn’t have any privacy for people to vote. It was really an exercise in demoralization. You want free and fair elections? Okay, here it is. And then they take it away. The whole idea is to breed despair. But they are playing with fire, because Haitians… it takes us a while to get mad, but when people make up their minds, they don’t mess around. In the 1980s, there were a lot of terrible things going on: organ trafficking, incredible misery, people having to sell their blood to make a living, etc. And then all of a sudden, boom! Jean-Claude Duvalier is in a car on his way out. Once people make up their minds, they don’t mess around. They’ve made democracy into an insult. The voter turnout was predicted to be 15 percent, but it was far lower than that. The elections should be annulled; they are completely worthless. They brought tens of thousands of observers who could not be found…. When I think of observers, it makes me want to laugh! Who says, oh Mommy, when I grow up I want to be an international observer? What kind of job is this? They get to travel to a nice Caribbean island, hang out in hotels, and then say, oh yes the elections were fine….. Over 30 candidates for the House and four candidates for the Senate were alleged criminals, some of them even convicted of serious crimes. These people are trying to get in government so they will have immunity from prosecution… They’re trying to take their criminal career to a different level…. There’s an electoral council that’s actually funded by the international community. There’s no sovereignty involved in these kinds of elections. This is an occupation election! RA: The US is one of the biggest funders for the elections, then come the EU, Canada, Japan, etc. Compared to $5 million in 2010, This time it’s going be about ten times more money? DC: This is the group. The whole thing is administered through the UN. It exceeds $50 million already. What for? To rent Haiti. That is really what it’s all about. RA: Haiti is the only nation to have established itself after a successful slave revolution. With this background, what do you expect to happen in the not-so-distant future? DC: Things can turn on a dime, and the international community is really forcing the issue. They’re rubbing into people’s faces that they’re under the boot of the international, and this is not something any Haitian wants. No matter what the divisions are between Haitians, nobody wants to be ruled by the international community! 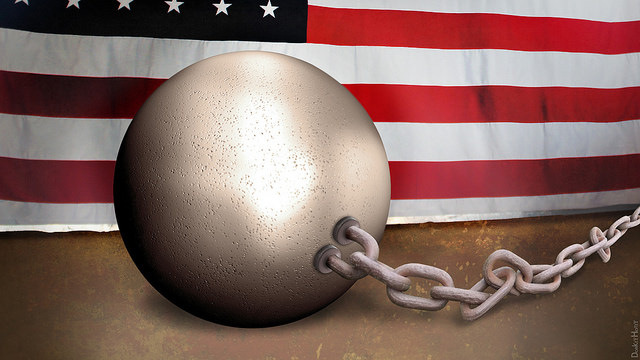 People have pride in the fact that we are the only country that came out of a successful slave revolution! When you think about this, the kind of psychological preparations it took…. to say: okay, we’re going to do this, and we don’t care if we get killed trying, but we’re going to do this! Vodou was very much a part of it. 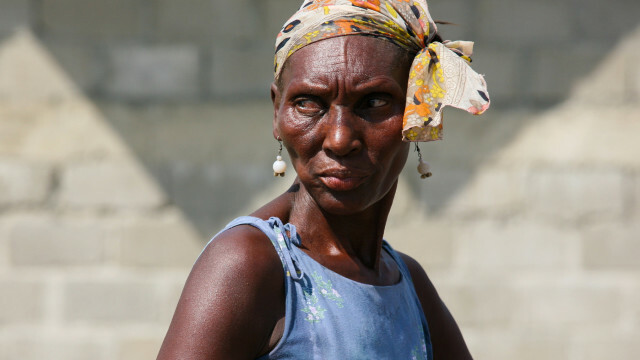 You had a Haitian goddess possess somebody at the Bois Caiman ceremony and say: “We will give birth to no more slaves!” The gods were in it, Haitians fought along with their gods in this revolution. People had to believe that they could beat the French, the British and the Spanish, and they did! It is tremendous! And of course, Haiti has a lot of traitors. There’s a tradition of treachery. These are the people who don’t believe that it can be done. They figure: well, I’m going to curry some favors with the powers that be, because I don’t think this will really go off…. I am really happy I was born Haitian! That I came from these kinds of people. I look at Vodou and the celebration and worship of the ancestors, I cannot imagine anybody worthy of more respect than the people who did this…. The Haitian Revolution was a combination of things. It was anti-colonial, anti-racist and anti-imperialist. While people elsewhere were talking pretty words about the rights of man, we were walking the talk: we fought! We changed the world, we changed the map of the Americas. 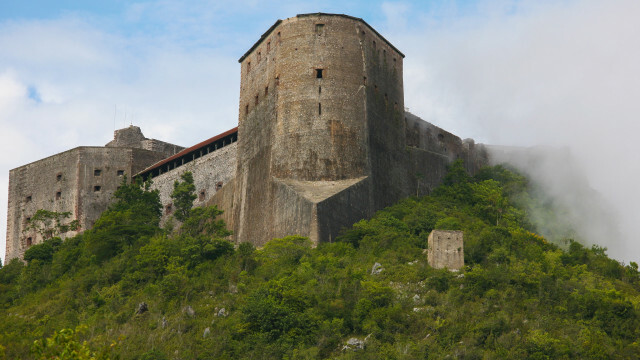 Haiti was the richest colony of France…. At the time of the revolution in the late 1700s, two thirds of the slaves were still brought from Africa, because people were working their slaves to death…. For a people to get out from under that kind of oppression and brutality is just phenomenal…. There are so many heroes in our history. 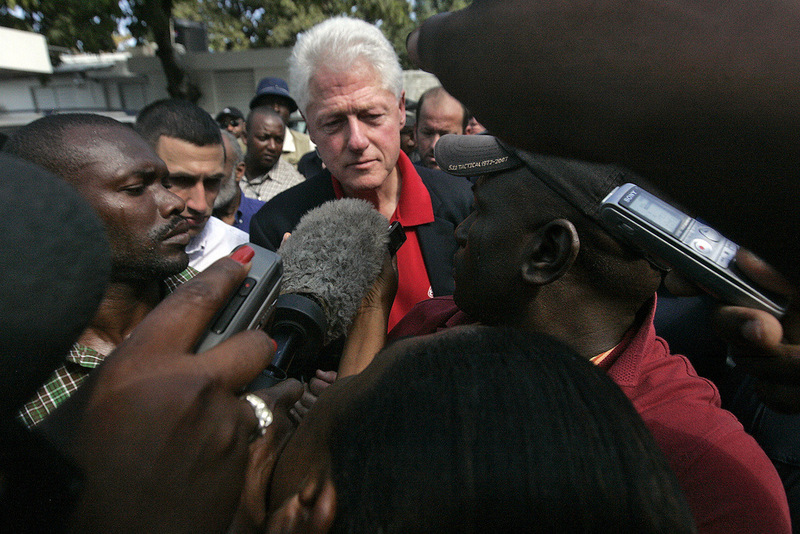 We don’t need anybody to come and play god in Haiti,… the NGOs and Clinton coming around playing god. Seriously! We have people in our history who make these folk look really small. RA: People who actually had moral fiber, which is hard now to see in many of our politicians, and it’s people who are coming around now to tell Haitians how to live. The United States did that back in the early parts of the 1900s, I believe too? DC: The US invaded Haiti in 1915, and this is the 100th anniversary of this…. Let me give you an example of what Haitians can do when they get mad. The president of Haiti had just murdered about 100 political prisoners. When things turned south, he took refuge in the French Embassy. People dragged him out and literally tore him to pieces. Woodrow Wilson, who was president of the US at the time… sent in the Marines. The first thing they did was to take control of Haiti’s treasury. The occupation lasted until 1934. Now, when people who are educated in the US or the West tell this story, they tend to tell it from the point of view that all these people did terrible things to us. They came, they stole money, they put us in chain gangs, and they lynched people, and they killed people, which of course they did. What’s always missing from these stories is the Haitian resistance. We have always resisted. What you won’t hear is that when the US invaded Haiti, almost immediately there was an armed resistance led by Charlemagne Perralte. They were called the Cacos. At their peak, there were about 40,000 of them. The whole time, the US was trying to keep the thing under wraps and calling them bandits. DC: And they call them gangs also; now they talk about gangs. RA: And to make matters worse, the US amended the Haitian constitution! DC: They certainly did! FDR bragged about it and said: “I wrote that constitution myself, and I dare say it is a pretty good little constitution.” The constitution allowed foreign ownership of Haitian lands for the first time. They set up a government that is very much like the current occupation. Only Americans could have white-collar jobs in Haiti. So you had all these southern racist Americans who had supported Wilson’s presidency, who came to Haiti to live in villas and have Haitian servants. They had all sorts of jobs that they were completely unqualified for. The NGOs serve the same function…. 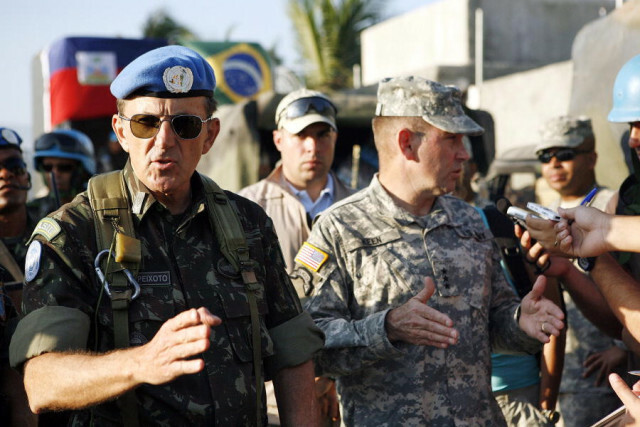 There was a US High Commissioner for Haiti, which was General Russell, and Clinton fulfills the same role now. The whole idea was to run Haiti together with a US-picked Haitian president…. The US rigged the election…. Martelly is the guy that they picked. He is a very vulgar musician. He has been quite honest about his ambition to become rich…. He has done a pretty good job at that…. The Haitian constitution now was also changed. Before they set up Martelly as president… the parliament was supposed to vote on over a hundred amendments in a couple of days…. Clinton tried to change the term limits…. It was all about giving power to the executive branch…. The parliament did not pass it, but they went through with all these changes by presidential decrees. There are no mayors in Haiti anymore! There are interim executives who are appointed by Martelly!… If all the money that was given to Haiti, or even a fraction of it, had gone to the local governments, it would have made such a change, because the local governance is by people who are very well respected generally and who actually care about their cities. It is the central government that is very tight with the international community and is completely corrupt. That’s precisely why they got rid of the local governments…. The interim executives have basically gone and looted places like the local city halls. Money from the local governments has gone missing, and there are people who are trying to bring them to justice. RA: That’s an admirable goal, but that’s going to be rough. DC: People keep trying. People always keep trying…. We fought that revolution, and we can do it again! We will keep fighting. They love to say “Haiti is the poorest country of the Western Hemisphere,” but I think Haiti is a focus of resistance against all the most reactionary forces in the world! That’s what we are! RA: What do you think will happen in Haiti within five to ten years? DC: Haiti will have a revolution. 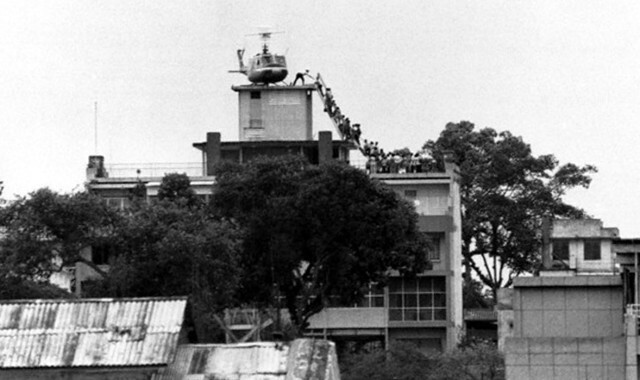 I will see all the NGO people scrambling onto helicopters on their way out. I am keeping a bottle of Champagne chilled for this!… We will get our country back, and the world needs to help us do this. 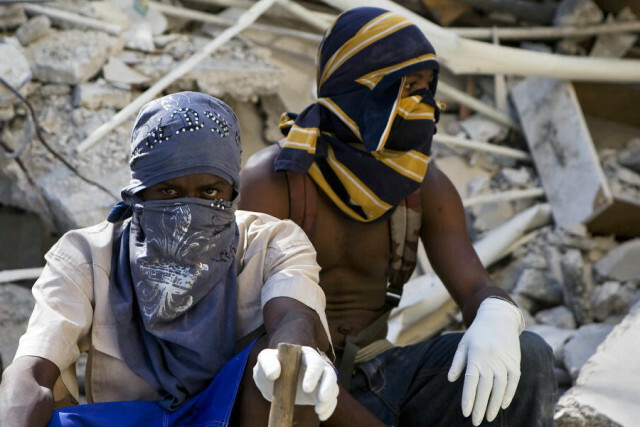 What they are doing in Haiti, they are practicing repression so they can export it…. Haiti is a laboratory. USAID, the World Bank and the UN have grown fat on Haiti… and now they’re about to move on to everybody else. USAID was nothing much in the early 1970s when it latched on to Haiti, right after Francois Duvalier died, and Jean-Claude Duvalier came into power. Francois Duvalier kicked out a whole bunch of these people, and he terrified them. He even kicked out the people of the Catholic Church…. He kicked out of Haiti anybody who opposed him…. The US cut off the aid, and that was actually the best thing that could have happened to Haiti. During that time, Haiti thrived economically. It was an agricultural economy operating largely on a barter system. Haiti produced all of its food, it was even exporting food…. This is what I grew up in, and this is part of the reason why I fight so hard for Haiti. My childhood was such a gift! I had such a rich childhood, and I didn’t even know that I was supposed to be poor. I was wearing tailor-made clothes, custom-made shoes, eating food in season and wild-caught. I had no idea how precious this was. I had an extended family with lots of mothers and fathers looking after me. I did not suffer any kind of racial prejudice…. I grew up thinking that I could do anything and I could be anything. There was absolutely no limit to what I could imagine, and that’s the way it should be for any kid…. Editor’s Notes: Image one by Donkey Hotey; photographs two, three, four, six, seven, ten and eleven from United Nations Photo archive; photographs five, eight and nine by Alex Proimos.